I call myself a feminist. I call myself a feminist because gender equality is something we're still striving for even in 2015, because women are still judged and treated in different ways to men and those ways are often demeaning, because being compared to a woman or female characteristics is usually a way to insult someone. 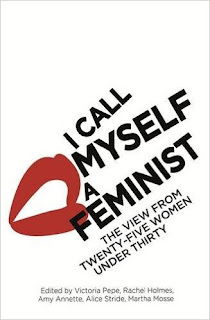 I Call Myself a Feminist, edited by Victoria Pepe, Rachel Holmes, Amy Annette, Martha Mosse and Alice Stride, features essays by 25 women under the age of 30 on feminism. From writer and journalist Reni Eddo-Lodge on what men can do to support feminism, to student Maysa Haque talking about her Islam and her feminism, to author Louise O'Neill writing about her journey to feminism, the book is full of different perspectives on women, their power and their struggles. It's the different perspectives that are key. I almost cried with joy when I saw the first essay was written by Hajar Wright. Could it be that this book was willing to include a non-white perspective? And as I read further, it became clear that there was more than one non-white perspective in the book, and that there was plenty of other diversity in the book too. The battle for feminism is one that affects all women, but women from non-white backgrounds, women who are not straight, women who are not middle-class, are often battling discrimination on two fronts, or more. Student Jinan Younis captures the subject perfectly in her essay Manifesto for Female Intersectionality, but intersectionality is addressed again and again throughout the book, and it made my heart sing. I Call Myself a Feminist is an important, powerful book that succinctly lays out why there is still a need for feminism. Its writers are brave, and its editors have curated a collection of essays that I want to press in to the hands of everyone I meet and say: "This. This is inspiring and needed and you should read it because it will help you understand the world and make it want to be a better place." We all still need to call ourselves feminists, and I Call Myself a Feminist tells you why. •I Call Myself a Feminist is released in the UK on November 5, 2015. How I got this book: From the publisher, Virago. This did not affect my review.